Price quoted is for 1 Feline Collage Silk Scarf . Rainbow Cats Silk scarf is dyed in a rich rainbow of colors including blue, purple, pink, red, orange, and magenta. Cats are outlined in gold. All Laurel Burch scarves are 100% silk, with a hand rolled hem. Canines & Felines Silk Scarf by Laurel Burch. 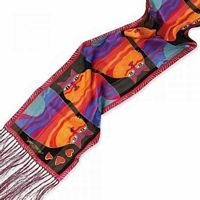 Laurel Burch shows that dogs and cats do get along in this Canines and Felines Scarf. This is a silk scarf with original artwork authentically created by Laurel Burch. Unbelievably soft, high quality silk and vivid, colorful Lauren Burch design makes this a perfect gift. Laurel Burch scarves have hand-rolled hems; this one is fringed. Silk scarf is approximately 11" wide by 53" long. Price quoted is for 1 Canines and Felines Silk Scarf. 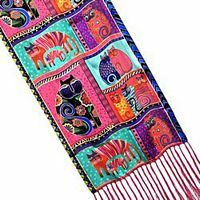 Laurel Burch shows that the jungle is not the only place for wild cats with this Wild Cats scarf. This is a silk scarf with original artwork authentically created by Laurel Burch. Unbelievably soft, high quality silk and vivid, colorful Lauren Burch design makes this a perfect gift. Laurel Burch scarves have hand-rolled hems; this one is fringed. Silk scarf is approximately 53" long by 11" wide. Price quoted is for 1 Wild Cats Silk Scarf. The best store builder by ShopFactory powers D488. All-in one store builder and eCommerce software.